Leadership Q&A: What’s On Your Checklist? All of us use checklists to stay focused on completing tasks. Our checklists are a window into how we perceive the work we do. What is on your checklist? It matters. This is a fairly common dilemma. I attribute it to the way organizations develop and staff the leadership functions of their business. People become managers and supervisors for a variety of reasons. From what I’ve learned over the years, it is based on expertise in the field they lead. Secondarily, it is because of leadership potential. Unfortunately, leadership potential is not the same as leadership impact. When organizations put people in positions of leadership who are not equipped to lead, one of the results is a checklist mentality. In effect, they are equipped to supervise tasks, not lead people. Ever had someone tell you “That it isn’t my job?” They are working off a checklist. The shorter the list, the easier it is for them. Little responsibility, even less accountability, no risk, and minimal impact, yet the checklist is done. 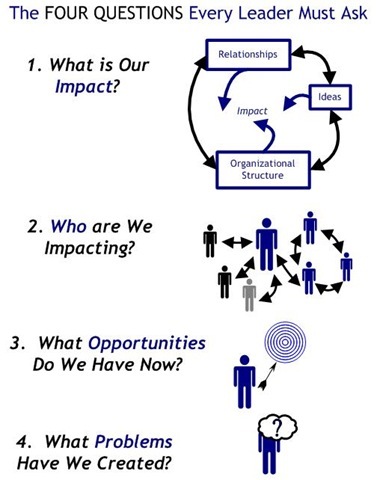 Leaders change this environment by focusing on the three dimensions of leadership found in the Circle of Impact. Taking initiative they create impact in the three areas of leadership impact: Ideas, Relationships and Organizational Structure. Here are three suggestions to begin to make the transition from checklist management to impact leadership. 1. Reframe the way you talk about your mission to focus on change, impact and the difference you make. How you communicate as a leader makes a difference. If you sound like a checklist, you are not going to inspire people to take ownership of the difference they can make. You need to tell a story that helps people visualize the difference they make. Too often mission statements are simply glorified descriptions of task lists. “Our mission is to do this and that.” Instead talk about what changes you want to create. It it is unclear, ask your customers, “What difference are we making?” Or, ask them, “When we are done, what difference do you want to see and experience?” What you’ll discover is that there is more to making a difference than providing your specific product or service. 2. Build confidence in your employees by respecting their talent and trusting their judgment. 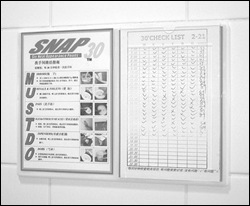 You have to work into this because if you are an old school checklist artist, you are probably also a compulsive micro-manager. If you are, then, you are creating the conditions for people to avoid taking initiative. It is why you have people doing their checklist and beginning to clear their desk 30 minutes before quitting time. If you talk with them and listen to what they have to say, you’ll hear ways to improve that make sense. Act on their suggestions and let them work out the details. As their leader, your job is not to control, but set expectations for the impact that you want to achieve. Confidence is built when people feel respect from their leaders, and are given the opportunity to make a difference. The greater the impact they create, the clearer sense of their own contribution to making the business a success. It is important, therefore, that leader acknowledge the impact that people create. 3. Redesign assessment, problem solving, and planning processes to focus on impact creation rather than task completion. There is an old management saying that goes, “What gets measured gets done.” To transition from checklist management to impact leadership, learn to measure change, in addition to the traditional measures of results. How do you measure change? You have to be very clear about the impact your business has on your customers/clients and employees, as well as you and your family. If you can visualize the change you want, you can create it. What is the difference you are making with your Ideas, in your Relationships and through your Organizational Structure. If you can identify this, track it, build upon, then you have made the shift to an impact leadership mindset. One tool to use is the Four Questions That Every Leader Must Ask. The questions can measure past performance, do a current assessment, and create a plan for the future. Teach your managers to use them with their teams and the whole company begins to think about impact rather than task completion. 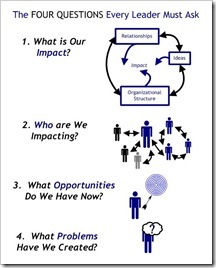 The Four Questions is a tool for simplifying the thinking / communication processes that are essential creating impact. Teach your whole company to think this way, and the task orientation changes to become an impact leadership one. Ready to start creating your impact leadership checklist? Tagged with checklist, impact, leadership.